We recommend and use Constant Contact for our email marketing. Sign up today and become an expert in email marketing and online surveys with live customer support and daily live demos and training classes. We found a great hosting and domain company called SiteGround. Move forward with your marketing strategy now! 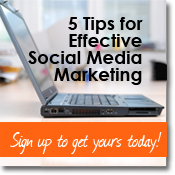 Sign up and receive 5 Tips for Effective Social Media Marketing.